Get affordable Security Camera installation on La Mirada, CA and CCTV equipment with commercial quality and 2 years warranty. We have been working in La Mirada, since 2005; we offer professional installations, with a low price. The first option when a customer with a tight budget wants to get a security camera system is a DIY security camera system. There are many options available at this time. The best thing that you can do is get some information about this topic. You can get some guides over internet about surveillance systems technology. 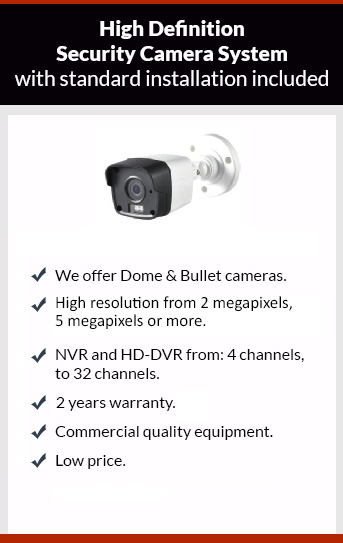 You will find that you can get a high definition security camera system in a really low price. The only problem in this case is that “you get what you pay for”, If you do not pay much money for something, it is probably of poor quality. If you really want to get a security camera system investing just a little money, it can be done buying a CCTV camera kit. There a lot of options out there from different vendors. The only problem to solve after you acquire the security camera system: the surveillance camera system has to be installed. You can find some directions on line, with some tools and skill you can install the system by yourself, or you can hire a CCTV installer. If something in the system fails has to be replaced by you. That means that you have to ship the part to the manufacturer, getting the part back is a long process. In other hand, if you decided to get a commercial quality system with professional installation and full warranty Protection4less is your option. You’ll get a free detailed proposal with the best price. We’ll need to make a previous appointment to check your home or your business. We will find how many cameras do you need, type of camera and wire involved in the project.